There has been a great deal of discussion concerning Britain’s recent employment and productivity record which has regularly been asserted as baffling economists and the bank of England. In essence the conundrum is that employment has recovered to pre-recession peaks whilst in terms of output the recovery has been very limited and stands well below (4%) that peak. This extended fall in productivity (making less with the same workforce) stands in massive contrast with previous recessions and recoveries where productivity growth was strong in the recovery. The figure below drawn from the recent ONS (2012), The Productivity Conundrum, Explanations and Preliminary Analysis by Peter Patterson, shows the productivity gap compared with the 1980s and 90s recessions stands in excess of 15% – a massive underperformance in terms of productive potential. A similar underperformance is apparent if we compare where we are compared to pre-recession trends. In the past, here and abroad, a loss of output compared to trend as a result of a recession, is subsequently unwound through a catch-up period of above trend growth this hasn’t happened, and a similar story is true of other countries. Whether any of this lost potential is recovered in the near future thus rests on why we have underperformed recently. This is actually easier to explain than the media description of baffled economists implies. 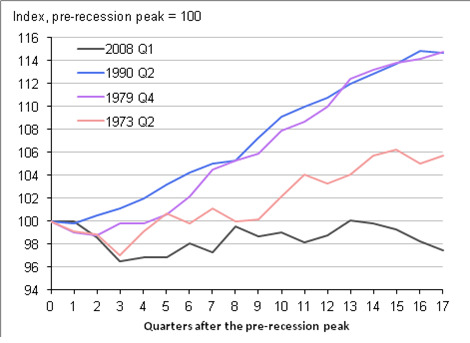 Productivity Levels compared to Pre-recession peak in four UK recessions. The first question concerns data reliability. Could some of the paradox be down to measurement problems? Certainly tomorrows GDP numbers for Q3 of 2012 will show a return to growth after last quarter’s numbers which were suppressed by the Queens Jubilee bank holiday and will suggest the economy is just growing over the past 6 months but this won’t make a dent on the sustained underperformance described above. As mentioned previously employment has recovered to the pre-recession peak but unemployment remains very high. This apparent paradox is easily explained. Right through the recession employment among the over 65s has grown quite rapidly. Older workers are not retiring as they used to do, pushed by changes to retirement rules which encourage longer working and penalise early retirement and for women the rising state retirement age. So compared to the early 2008 employment of the over 65s stands 250,000 higher and a similar magnitude of extra employment has occurred among women between 60 and 65. Nearly all of this extra employment among older workers is either part-time or self-employed and often both. When we add in a growing population the proportion of the working population in work stands at 71.3% still well below the pre-recession peak of 73%, a shortfall of nearly ½ million jobs. Further there has been a sharp trend of more people wanting to work, especially among those aged between 50 and 60. This has been going on for a decade now but until recently this was offset by more people studying when young – so the share of the population wanting to work was constant at just under 77%. Over the last two years this increase in students has stopped. Perhaps because of a surge in the immediate recession period or a response to policy changes but either way it is adding another quarter of a million to the workforce so that whilst employment has reached previous peaks, the need for work stands considerably higher with a deficit of a million or so jobs. The move to more and more people wanting work, especially among older workers, and so we need to add at least 250,000 jobs a year to stand still and the employment recovery is thus not as good as it first appears. Allied to this is the rise in the numbers working part-time who want to work full-time, which is called under employment. The numbers who are unemployed stands at 1.4 million is shortfall which when combined with 2.5 million underemployed suggests huge unmet need for work. However, the fact that most of the jobs created since 2009 are part-time, fewer hours worked only accounts for about 1% of the productivity decline since 2008 (ONS, op cit). It has been suggested that there may have been an under recording of employment before the recession, with a large number of migrants not being captured and that these marginal workers have since lost work and left the country again unrecorded. There are a number of major problems with this argument. First, our data on employment comes from two very different sources, one based on households and the other firms. Neither of them questions the legitimacy of an immigrant’s status and so there’s no incentive to hide migrants; therefore in terms of residence these migrants might be hard to find and perhaps be reluctant to reply to a survey, employers have no incentive to hide these workers and both surveys tell the same story about employment. If the firms using this labour are not tracked by the ONS then they will not be present in the output data nor the employment data and hence can’t explain the paradox. In addition it requires a huge number of missing migrants to explain the gap, at least 8% of the workforce and that all these workers lost their jobs with the recession. If only one in five lost their jobs, compared to 1 in 20 in the rest of the population, the numbers would need to be equivalent to 40% of the workforce. This is just implausible. So the employment story is clear there has been an employment recovery, verified in a number of sources, but this recovery has not met the increased demand for work in the population, leaving 3.9 million unemployed or underemployed. The output side of the story also appears validated by tax receipt data. 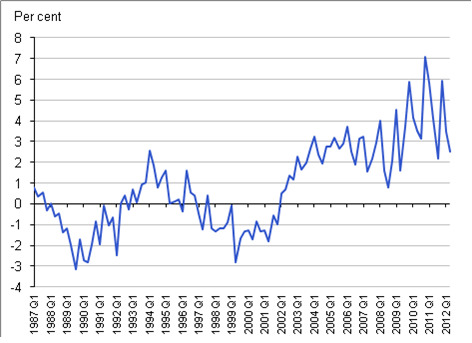 The ONS report shows how tax receipts VAT, PAYE and in total track the picture of nominal GDP well. That is the total size of the economy measured at current prices and serves to track government receipts well. However when we talk about output we take out the effects of inflation, so there could be a concern the effects of inflation have been overstated and there is more real output out there than estimated and low price increases. This argument tends to be supported by other inflation measures we have, the Consumer Price Index and Retail Price Index (which also includes housing costs) all show that inflation has been strong through this recession. So measurement can only explain a very small part of the story of economic underperformance with a good employment performance. This provides a serious paradox, so where can the explanations lie? The first argument is one I would have made two years ago, that firms were hoarding labour in the face of recession. In the first phase of a downturn, firms who are profitable will hold valuable labour, with its skills and experience in the expectation that it will be needed again in a year or two as demand returns. Only if a firm is in acute financial distress does it shed skilled labour, when the firm’s very survival is at stake. This was thus eminently plausible in the early part of the recession. But firms hoarding labour would not recruit new staff to replace those that leave through natural wastage, move to a new job or retire etc. Hence such labour hoarding should start to unwind even if there is no economic recovery. Rather we have seen the reverse of increased employment without growth. Even though surveys show some firms hoarding labour this should be a diminishing issue rather than a growing one. As such this cannot be it can’t be the major explanation of current trends. A variant on this is, if you like, is firm hoarding or as NIESR has described it ‘Zombie firms’. The argument is that banks are not lending to new or expanding firms as they seek to rebalance their own finances. It should also be noted that equally they are not forcing poorly functioning firms into bankruptcy and thus increasing bad debts held by the bank, and as such they are being allowed to persist despite the implied capital misallocation. The argument therefore runs that firms are expanding without capital through increasing employment rather than investment, whilst poorly performing firms are employing workers but are experiencing low productivity because of low order numbers. This is attractive and it is certainly the case that investment is low but there is no evidence to date that this low profitability Zombie sector exists. Certainly overall firm profitability is high outside manufacturing, which continues to struggle. Profitability in the dominant service sector is only slightly lower than in pre-recession period and recovered two thirds of the lost profitability during the recession, which in itself was quite muted compared to previous ones. As such the evidence of zombie firms is not obvious and requires an investigation of company level data for further insight, but at first take it does not feel like it is a major factor. The evidence of low investment is strong however; firms normally borrow money and invest in productivity enhancing technology. Currently firms are saving money rather than spending and are net lenders not borrowers. This is now evident on a very large scale and well that seen in the last recession at a massive 4% of GDP. The scale of this seems to point to healthy profitability being saved rather than invested as opposed to Banks not lending to growing firms and trying to reduce the net debt position of struggling firms. So why would healthy firms choose not to invest? The obvious answer is that in the current environment it is easier, cheaper and less risky to hire to meet demand rather than invest. Real wages have fallen steadily since late 2008 and saw a large squeeze in the high inflation burst in 2011. Overall wages have fallen by around 8% since early 2008 in real terms (measured using Retail Price Index), this squeeze on wages is more than enough to explain the fall in productivity since 2008. Using a standard elasticity of demand for labour of around -0.5 then an 8% fall in real wages would raise employment by about 4%. In a period of uncertainty about future demand building cash reserves rather than investing for the long term is safer. Employing extra labour is easy to reverse if demand for product turns out worse than expected. At complete variance with the rhetoric of parts of government and their advisors and evident from firm behaviour hiring workers is easy and low risk. By contrast investments are largely irreversible and therefore inherently more risky. Hence as labour is increasingly cheap and low risk firms are choosing this route rather than replacing ageing infrastructure and machinery. The apparent divergence between productivity since 2008 compared to previous recessions is huge but can be usefully broken into two parts. The first is that employment has recovered to pre-recession levels despite output still being 4% below the peak. This is partly explained by employment composition moving toward part-time work but mainly because labour has become increasingly cheap and low risk and hence firms are substituting labour for capital. This is occurring because real wages have seen such a large cut over the last four years. Research I’ve undertaken with Steve Machin for the Resolution Foundation shows that this in turn is a combination of a slowdown in real wage growth that occurred well before the current recession In addition there is clear evidence that wages have become more sensitive to unemployment such that the near doubling of unemployment from 4.6 to 8.3% we’ve seen since 2008 results in real earnings being £750 lower now than would have been the case from a similar unemployment rise in the 1990s recession. These changes have their origins in the decline of trade unions, a reduction in the imbalance of unemployment across skill groups and regions and welfare reforms which have meant that the completion for jobs is more intense. The larger part of the shortfall in productivity compared to past trends and recoveries however, stems from low demand in the economy and the corresponding absence on investment to meet that demand. The implications are threefold. First, employment will rise and unemployment will fall well before there is a recovery in wages and productivity. However, as unemployment falls real wages will start to grow again as the heavy downward pressure on wages in the current labour market eases. This is the pattern already and it will continue until unemployment is firmly on a sustained downward trajectory. When output starts to recover and real wages stop falling firms will mostly likely start to invest their large cash surpluses currently held. This of course, need not all be in this country and the location of this investment will impart depend on the quality of the available workforce and the large scale geographical focus of world growth, with European economic recovery, including the UK, being more important for us. When this dam holding back investment is broken a period of strong growth should follow, as investment and rising wages fuel growth and hence perhaps 2/3 of the lost productivity will be recouped. However in my view at least 1/3 of the 15-18% shortfall in productive potential is lost. The longer the period of high unemployment, falling real wages and low investment continue the greater the damage that will be done. The policy prescription that follows is reasonably obvious. First, incentives for firms to invest now rather than in the future need to be enhanced. This need not cost a low to the exchequer just rather a change in timing. Second we need to boost other investment in housing, lending to small firms and new low carbon technologies. This could happen through the government borrowing more, the treasury acting as a guarantor for borrowing by housing associations to build more low rent housing (so resources can be drawn from pension funds and the like) or through quantitative easing being invested through a national investment bank rather than used to try and manipulate bank finances. The government is feeling its way slowly to the second option whilst hoping that it doesn’t need to go further. Meanwhile Rome burns. The coalition government plan to implement substantial cuts in spending on public services, with most departments having been asked to find budget cuts of 25%. The government hopes to achieve these cuts without such radical effects on what it delivers. The up-coming Spending Review aims to make efficiency savings and “to consider how to deliver a step change in public sector productivity”(i.e. the ratio of public sector outputs to inputs). Public service reforms may deliver genuine efficiency improvements, but even in their absence the spending cuts are is likely to be successful in increasing measured productivity in the public sector. 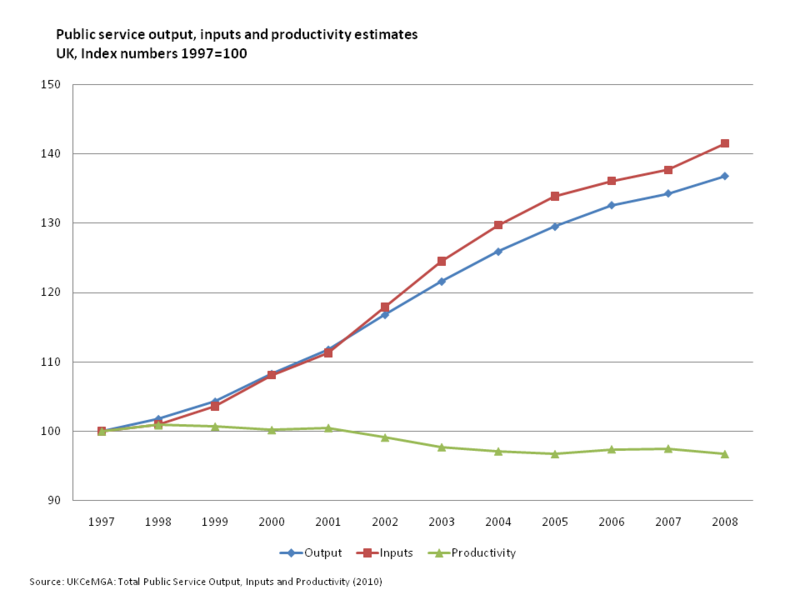 The graph shows the National Statistics measure of public sector productivity from 1997 to 2008. Productivity falls as the increase in inputs outstrips the growth in measured output. As inputs decrease this is likely to be reversed. Measuring the quality of public sector outputs is extremely difficult – just as the numbers may not include all quality improvements as inputs rose, the output measure may miss any deterioration in service quality as inputs fall, leading to an increase in measured productivity. With the prospect of public sector pay freezes, quality decreases may arise through talented staff leaving for the private sector. Research suggests that remuneration over the lifetime is roughly similar in the public and private sector with a small public sector premium. Hence there is a risk, with public sector pay frozen, and if jobs become available, that quality will decrease if some of the most able employees go private. Shifting a substantial fraction of activities out of the public sector, for example to be delivered by charitable organisations, could also increase public sector productivity if those services were relatively resource intensive and low productivity. But then comparing the performance of total publicly-provided services over time, and inherently the performance of successive governments, would not be meaningful as the measure would not be comparing like with like. Postel-Vinay, F. and H. Turon, 2007, “The Public Pay Gap in Britain: Small Differences That (Don’t?) Matter”, Economic Journal, 117, 1460-503.